Our firstborn started kindergarten this year. Kindergarten. What’s that saying about the days being long and the years being short…? Yeah. That. A perennial optimist and off-the-charts extrovert, she had extremely high expectations about how the whole thing would go. 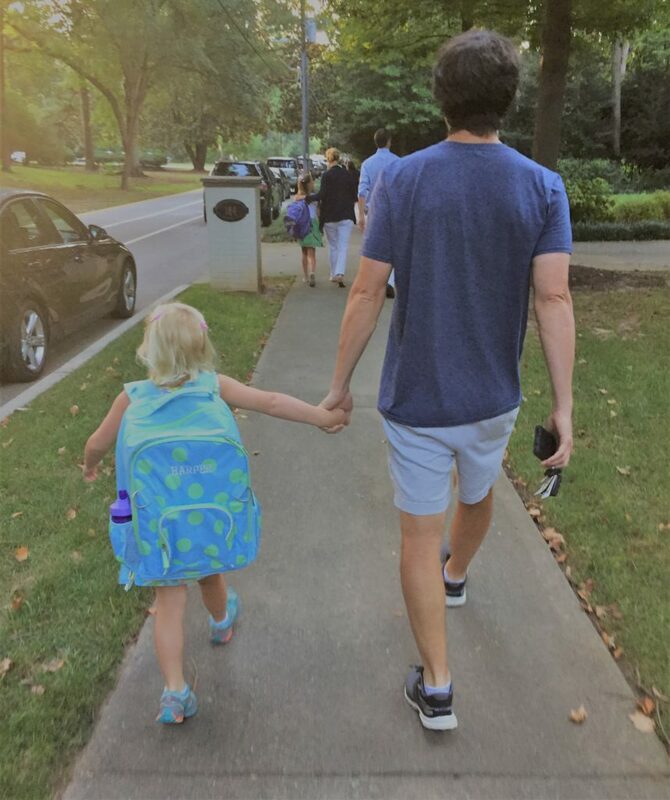 Her dad and I walked her in on that first day expecting to have to deploy encouraging parenting wisdom and perhaps dry a few tears, but instead we were shouting “wait for us” as she skipped down the sidewalk into her new school. She found the hook with her name on it, hung up her backpack, and walked right in her new classroom like she has been doing this for years. I waited anxiously for the bus that afternoon, hoping that day one of kindergarten lived up to her oh so high expectations. “This was the best day of my life,” she said before I could even ask. The next day I got an “awesome” when I asked her about her day…but then nothing else. I felt like a little lap dog as I peppered her for details each afternoon. Nothin. Clearly asking “how was your day” was getting us nowhere. It was time for a new tactic. In an effort to know her and her world better, we started a dinnertime tradition. I wrote out a bunch of questions and conversation starters on little pieces of paper. 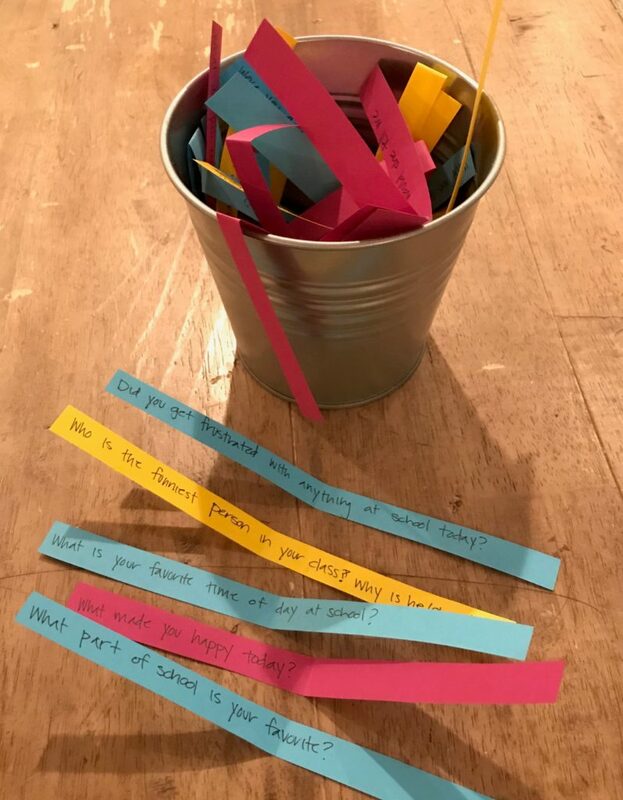 Each evening while the little ones are eating dinner, we pick three or so colorful questions out of the bucket and read them. Her answers include tons of detail and I usually get stories about the day and insight into what is really going on in her heart and what’s on her mind. 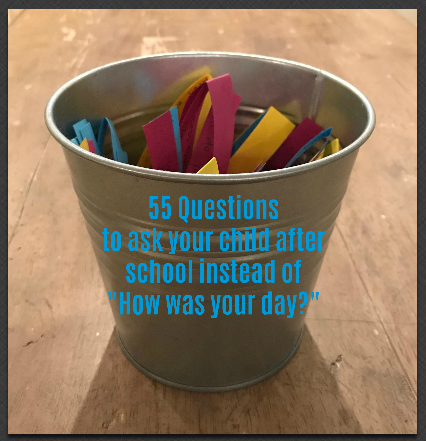 The grown-ups usually answer too—most of these questions can be paraphrased and applied to what when down at work as easily as what went down at school. Our two-year-old even answers a question or two, and we nod along as if we understand her version of English and/or reality. Here is a list of questions that you can pick and choose from to ask your star students. Great conversation guaranteed. Can you tell me an example of kindness you saw or showed today? Can you think of a helpful thing you wish you had done today? Do you know anyone in school who has trouble making friends? How could you help? Can you imagine being a teacher at your school? A bus driver? How do you think you would feel doing those jobs? Can you think of one act of kindness you would like to share tomorrow? 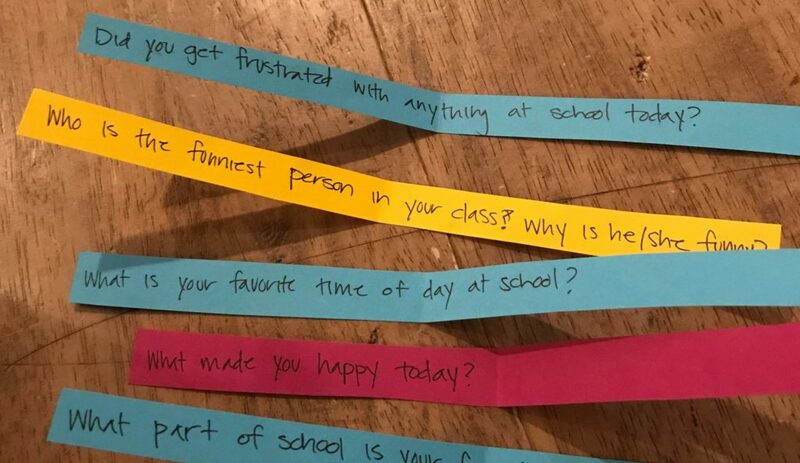 Do you think your teacher ever feels frustrated, tired, or angry at school? How did you help somebody today? How did somebody help you today? If you could call anyone right now, who would it be? If you could plan the family vacation, where would you take us? If you could re-live anything that happened today, what would it be? Is there anything you wish you had done differently today? Rate your day on a scale from 1-10. What would have made it a 10? What did you do today that was creative? What do you like best about our family? What frustrated you the most today? What is one thing you hope to do better tomorrow? What made you the happiest today? What made you the saddest today? What was the best thing that happened at school today? What was the worst thing that happened at school today? Who did you enjoy spending time with today? Why do you think it’s important that friends, teachers, and students help each other during the school day?